Nineteenth century America sang family songs, church sociable songs, courtin’ songs, and work songs, all of which were distinctly get-together and respectable songs. The folksongs and ballads concerning gamblers, however, mainly belonged to a different class. They fell into several categories: “bad man” songs, the scandalous “gutter ballads,” and the tragic blues that were generally sung by an individual and rarely by groups. The gutter ballads and the tragic blues, which did not appear until the last half of the nineteenth century, were never sung in the family circle. They were raw and untamed songs–strictly Saturday night stuff. A large number of the ballads and blues concerning gamblers and gambling personalities were starkly dramatic and intensely tragic. It seems as if a song was born every time a gambler was killed, and many local ballads about gambling spread over into other regions where the personalities meant nothing and the pointed legend everything. Many gambling ballads have the atmosphere of the city red-light and crime-ridden districts, the skid row cribs and saloons of the railroad and lumber towns, and the bordellos and gambling dives of the trail-end frontier towns and mining compmunities. But not all came from the bagnios or gambling saloons. Little people composed them, the plain people who made the two-gun gamblers legendary in homespun songs. Notorious gamblers and their unorthodox life, then as now, gripped the imagination of ordinary citizens and their songs and ballads romanticized the scandalous and the tragic. Folksongs and ballads about gambling men are not necessarily or exclusively stark. There are some in which the gamlber, a gay rogue, delights in being a sporting man. Professional gamblers in early frontier mining communities excited the envy of prospectors and townfolk alike and inspired vigorous songs about the men who made their living with a deck of cards. And there are the ballads which tell of the high spirits and thrill of various type of gambling, and of the excitement and pleasures of winning–as well as depression and sorrows of losing. Even a gambler knows what it is to love and be loved, and there are songs and ballads about this aspect of their lives, too. Sometimes it ended happily and the gambler gave up his rowdy life. But more often it ended in tragedy or two-timing, in which case the gambler packed his bags and took off for other gaming tables–and other loves. 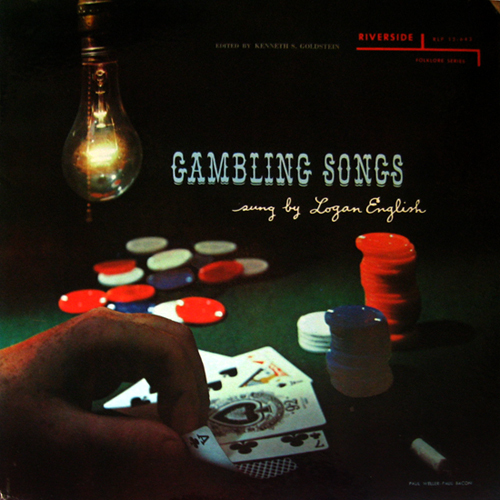 Until the statutes outlawing gambling universally are passed (and obeyed), men will continue to make up new songs about gambling and to sing the old ones with the same vigor that their forbears did. Here is an album of such songs. May your delight in them be no less than that of the countless singers who kept them alive and passed them on.